CRI > Cleaning and Maintenance > Why are Seal of Approval Products Right for Your Home? What’s the Carpet and Rug Institute? 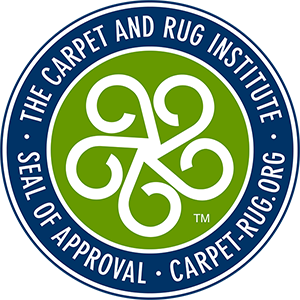 Headquartered in Dalton, Georgia, the Carpet and Rug Institute (CRI) is the national trade association representing carpet and rug manufacturers and suppliers of raw materials and services to the industry. CRI members account for more the majority of all carpet produced in the United States. CRI is the leading source for science-based information on carpet. Its mission is to provide the carpet industry, its customers and the public with facts that enable informed flooring choices. CRI is a resource for everything from carpet selection and installation to care and cleaning. The CRI Seal of Approval program tests the effectiveness of carpet cleaning products and certifies those products that remove difficult stains or a sufficient amount of soil without damage to the carpet. Not all products clean well enough to earn this distinction. Seeing the CRI Seal of Approval logo on products helps consumers recognize that they are buying quality products. What types of products are tested? Under the Seal of Approval program, tests are conducted on cleaning solutions and equipment. Each product is tested at an independent laboratory against control samples to assess product performance using scientifically accredited cleaning standards. Spot removers, pre-spray/in-tank, and encapsulate cleaning solutions are tested for overall cleaning effectiveness, pet stain/odor removal effectiveness, rate of resoiling, pH, optical brighteners and colorfastness to light. Deep cleaning extractors are tested for soil removal efficacy, amount of residual moisture and appearance retention. Deep cleaning systems (which use a specific machine used with a particular cleaning agent, following a set procedure) are tested for soil removal efficacy, resoiling, appearance retention, residual moisture, surface appearance change with repeated cleaning, colorfastness, pH and optical brighteners. Vacuums are tested for soil removal, soil containment and wear to the carpet. Interim systems are tested for soil removal and appearance retention. Why is the Seal of Approval program necessary? Not all cleaning equipment and solutions achieve the same results. Independent testing has shown that some cleaning detergents and spot removers clean no better than water. Worse, they can leave a sticky residue that attracts soil at a faster rate. Also, the equipment used to clean carpet varies widely in its ability to remove soil, recover water and maintain a carpet’s appearance. How does the Seal of Approval program benefit customers? Effective carpet cleaning helps maintain the life and beauty of the carpet. This means customers get more enjoyment out of their carpet, and more value for their investment. Also, helping carpet maintain its life-cycle cuts down on its premature removal to landfills. And that benefits everyone. Finally, some carpet companies require the use of Seal of Approval products as part of their carpet warranties. What are the Platinum, Gold, Silver and Bronze ratings? The Seal of Approval program utilizes XRF technology to measure precisely how much soil various cleaning equipment and systems remove from carpet. Vacuums, extractors or cleaning systems which meet the strict minimum requirements for the Seal of Approval qualify for the bronze rating. Those achieving higher levels of soil removal receive silver or gold ratings. Recently, the Platinum Level was added for those extractors and cleaning systems which achieve the highest level of efficacy. What else should people know about carpet cleaning? Today’s carpets are more stain resistant and durable than ever, making them relatively easy to clean and maintain. However, preserving the life and beauty of carpet depends on several factors: the quality of products and equipment used to clean carpets; the frequency which carpets are cleaned; and the skill and knowledge of the people doing the cleaning.